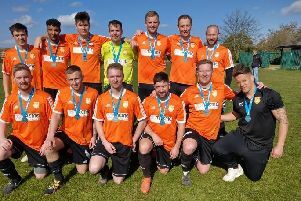 Peterborough Sunday Morning League club Parkway completed a cup double in fine style last night (April 8) when their reserve team won the PFA Lower Cup. They won a one-sided final 6-0 against Moorhen Reserves just 48 hours after their first team beat Stanground on penalties in the PFA Senior Cup final. Scorers in last night’s triumph were Ian Bradbury (2), Daniel Stephens (2), Steve Shaw and Andrew Cook. Parkway Reserves are top of Division Three while Moorhen Reserves are second in Division Four. Parkway Reserves: Matthew Cox, Ian Bradbury, Lewis Hearn, Luke McDowell, Aaron Parker, Steve Shaw, Greg Stanley, Daniel Stephens, Jamie Stephens, Liam Whaley, Jake Woodward. Subs: Antonio De Paolo, Andrew Cook, Justice Goodwin-Nkwocha, Gareth Tidey.